Home » Mathematics » What is the straight line segment that passes through the center of the circle? » What is the straight line segment that passes through the center of the circle? What is the straight line segment that passes through the center of the circle? A straight line segment that passes through the center of the circle and whose endpoints lie on the circle. It can also be defined as the longest chord of the circle. Both definitions are also valid for the diameter of a sphere. In more modern usage, the length of a diameter is also called the diameter. 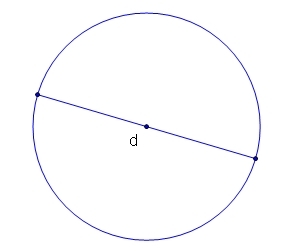 In this sense one speaks of the diameter rather than a diameter (which refers to the line itself), because all diameters of a circle or sphere have the same length, this being twice the radius r.